So it seems the Transformers are bored of Earth – let’s bring The Moon into the story! When the Autobots, a race of alien robots, learn of a hidden spacecraft on the moon, they decide to secure the secrets of the spacecraft before the Decepticons get to it and start an all out war on Earth. The introduction of this instalment sees historical events mixed in with fictional such as the first moon landing mixed and a portrayal of President Nixon; it even includes a great cameo later in the film from Buzz Aldrin. This initially makes the story extremely interesting and it’s continued throughout with a claim that the Hoover Dam was built to protect the AllSpark. This mix of real life footage and a fantasy element helps the Transformers instantly engage with the viewer and adds a context to the film. Alongside this, it also introduces a new angle for our lead: what happens to a hero when he’s not a hero any more and can’t even get a job? This combined is a brilliant start to a promising looking film. With a new situation a few years on from the previous instalments, we also see new characters emerge like Sam’s new girlfriend, Carly, and the US Director of National Intelligence, Charlotte Mearing. After Sam’s previous heroics, Mearing continuously comes across as frustratingly difficult and is annoyingly against every idea given to her and this completely detaches the viewer from her and makes her rather irritating to watch. On the other side of the coin, Sam’s new partner, Carly, doesn’t make much of an impact at all and certainly doesn’t have the aura or edge of Megan Fox’s Mikaela, or the development to introduce her as an interesting new character. After the brilliant first twenty minutes, the film awkwardly falls into a lull with nothing of consequence happening for about an hour except offering more answers than there are decent questions. We’re unnecessarily force-fed background information of what’s happened with flashbacks and discussions, which ultimately leaves the story lacking in ideas of how to move on. Once the Decepticons finally begin to act on their evil plan the film picks up again, but it isn’t long until all appeal is lost when we brace for an hour-long baddie vs goodie battle that’s quite similar to the battle in the first film, but with more buildings falling over. 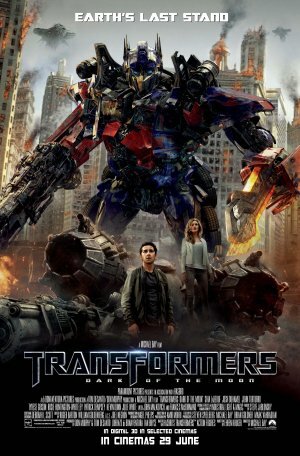 Transformers: Dark of the Moon is not a bad film and offers a unique story line, but the lack of pace for a large part damages it beyond the enjoyable action flick it was meant to be. On top of this, new characters make a bad impression, leaving it is as a fairly limp attempt at mimicking the heights of the first in this reinvigorated franchise.